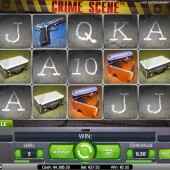 Fans of the crime genre have been pretty spoiled over the years when it comes to finding slots. Sheriff Gaming's London-set crime slot, Piggy Bank, and Betsoft Gaming's take on the Pink Panther, After Night Falls, both certainly staked claims to be among the best 3D slots made. Well, the latter developer have been at it again with their cops n' murder adventure slot, Crime Scene. Can they improve on After Night Falls? 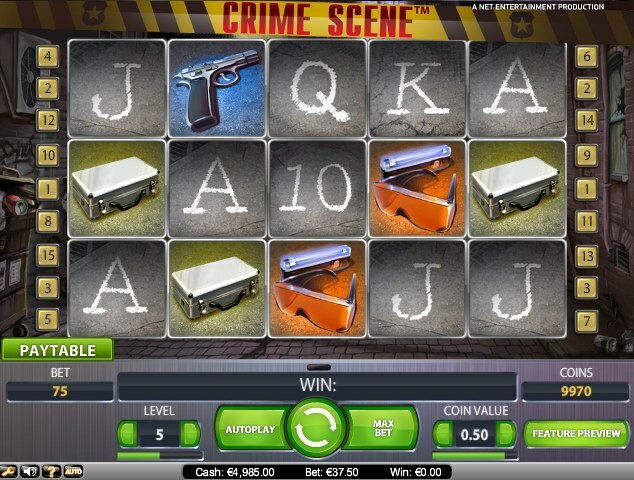 Taking place in the world of detectives, Crime Scene is a 5-reel, 15-payline slot chock full of forensics-themed symbols and bonuses. And with television series like CSI still massively popular on TV, it's a clever route for Net Ent to take. On the reels we get cases of forensics equipment, dusted fingerprints, guns, suspects' footprints, microscopes, and the familiar 10-through-Ace symbols, here depicted in chalk outlines, as if someone's stumbled across the particularly gruesome murder of a pack of cards. Not content with doing normal Wilds, Net Ent make theirs in Crime Scene sticky, meaning that when it hits the reels it stays put for up to five spins, meaning many more wins are possible. The Wild also assigns itself a random multiplier on every spin. In case you were wondering, the Wild is represented by the Fingerprints symbol, and it substitutes for all other symbols except the Bonus police badge symbol. Look out for that Badge, as three or more across the reels triggers the bonus round. Here you'll have to slip on the detective's hat as you collect evidence to the murder. Click on any one of 30 evidence folders to reveal random cash prizes. Click on the red cross and your turn ends, but you'll get to choose from four envelopes to reveal a second chance token, random multiplier, or cash. There are four fingerprints to be found among the folders; pick them all and you'll win a massive cash bonus. While not quite hitting the atmospheric heights of the Betsoft and Sheriff slots on a similar theme, the great bonus round in Crime Scene ticks enough boxes to make this a worthwhile filler of your time. Sticky Wilds all round!